There are plenty of easy and simple ways that you can detoxify your life in your own home! Here are three simple steps that you can start taking now! 1. 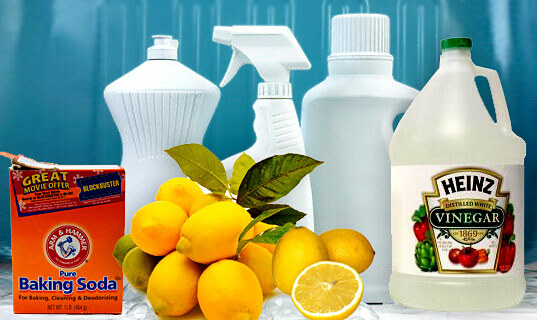 Trade in your store bought cleaning products for homemade ones. Why: Because the ones typically found on store shelves contain harmful chemicals that make us sick! Read the label of what you have in your house now and notice how many of the ingredients you have never heard of! Try Googling some of them and see what you find! Most of these products contain toxins that can cause cancer and irritate the respiratory system in some way. How: Use clean products! Instead of using products that contain chlorine, such as using bleach to kill mold, try using peroxide! You can clean your counters, toilet bowl, and tile floors with a mixture of water, distilled vinegar and baking soda. For a disinfectant, add a couple of drops of tea tree oil to a spray bottle containing water and a basic soap cleanser, like Castile Soap. Also, microfiber cloths are a great replacement for duster sprays and shammy cloths eliminate the need for anything but water when cleaning windows, mirrors and shiny surfaces! 2. Phase out your wrinkle free shirts for ones that need ironing. How: This will take time, as many of us don’t have the money to just throw away our current wardrobe and buy new, but as your clothes wear and fall apart, as the ones with chemicals often do, replace them with clothes made from untreated materials. Of course, buying clothing made from organic cotton and wool is your best option. As far as men’s dress shirts, make sure the ones you purchase doesn’t say stain resistant or wrinkle free. 3. As you need new furniture and mattresses, replace them with ones at are as natural and/or organic as possible. The same formaldehyde found in those wrinkle free shirts are found in furniture as well. This, combined with the chemical flame -retardants used on mainstream cushioned furniture, is what ends up as dust in your house, covering everything, even when we can’t see it. How: You need to find safe and trusted sources. Don’t just believe what you read – furniture and mattresses and big ticket items. Call the companies and speck to the owner, if you can. Ask if they use flame-retardants and formaldehyde. If they don’t know the answer, find someone who does. Chances are, if they can’t tell you an answer, the answer is yes. With My Green Mattress, you can call and ask to speak with Tim or Kathy anytime. They run the business and make the mattresses, and can tell you anything you want to know. But, just so you know (in case you want to take my word for it), there are no chemicals used!